FIRST published in 1997, the book is a contribution to Chapter 13 of Agenda 21 of the United Nations Conference on Environment and Development (unced). The world's mountains finally received the attention they deserved at unced, commonly referred to as the Earth Summit, which was held at Rio de Janeiro in 1992. This attention, expressed formally in Chapter 13 -- Managing Fragile Ecosystems: sustainable mountain development of Agenda 21, is the unced's primary product. The document recognises and gives the same level of priority to the mountains as other endangered ecosystems as tropical rainforests, semi-arid lands, wetlands, the oceans and Antarctica. Mountains account for one fifth of the Earth's land area, providing direct life support for about a tenth of human population. 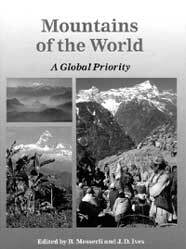 The book aims at initiating practical steps towards achieving sustainable mountain development. The first part of the book, Introduction, provides an overview of mountains worldwide, the complexities involved in the very definition of the word "mountain" and information on Chapter 13 of Agenda 21. The second part, The human dimension of mountain development, comprises five chapters. Grotzbach and Stadel analyse the scarce resources in relation to the threat of over-population. They also discuss the role of mountains as a barrier to refugees. P Reider and J Wyder confront the issues faced by the people living near mountains that are located in remote areas in an ever increasing commercially-driven world. The last chapter deals with the issue of mountains being hot spots of conflict, arising over sharing of natural resources due to ethnic diversity or as places for waging guerrilla warfare. The third part deals with Mountain ecosystems, resources and development. The book covers issues ranging from natural resources including biodiversity, natural resource management, utilisation and potential to tourism, mountain agriculture and forestry. J Bandyopadhyay provides an insight into the role of mountains as a source of natural waters. The effect of mining on mountain soil is driven home by several case studies. Throughout human history, mountains have been centres of society in many tropical and subtropical nations. At other places, mountains have been places of refuge. While mountain tourism and the resulting impact have been often discussed, M F Price describes amenity migration, the movement of people into the mountains from the plains -- either seasonally or throughout the year in search of attractive environment and cultural resources -- to find refuge from stressful urban areas. In a chapter on mountain agriculture, N Jodha explains the characteristics of mountain farming and the constraints faced by mountain farmers, with the aim of identifying future approaches and strategies conducive to sustainable agriculture. The book talks about the return of traditional Inca watershed technology, the importance of using watersheds as a land unit for planning and management, the deterioration of soil conservation practices and the importance of rural participatory approach. K Hewitt discusses mountains and disasters, both natural such as earthquakes, volcanic eruptions and manmade ones such as road construction. The author addresses the issues relating to the displacement of people due to these disasters, diseases and conflicts. The vulnerability of the mountain people in this context and methods to reduce this vulnerability are suggested. M F Barry Price and R G Barry discuss the evidence of climate change in the mountains and speculate on possible future changes. The fourth part of the book, Mountain Agenda for the 21st Century, may be called as a summary. E H Sene and D McGuire outline the progress on the mountain agenda, discussing emerging priorities and suggesting action for sustainable mountain development. J D Ives and others describe seven prerequisites for a 21st century agenda -- mountain perspective, reciprocity, devastation, hazards, awareness, knowledge and research and policy. The book consists of updated information, a prerequisite for anyone involved in mountain-related issues. The book make good reading, even for those who are just plainly curious. The intimate relationship between man and his environment, more so in the mountains, is poignantly brought out in the case studies. The photographs are excellent. One only wishes that they could have been in colour.